JenniferLast week was our fourth Halloween in Sweden, if you can believe it. As discussed previously, Halloween is not really a holiday here, but it is making small inroads. And every previous year, we have had candy on hand 'just in case.' (Translation: it's a good excuse to eat candy.) This year, however, I forgot to have some out on the actual evening of Halloween. Guess what happened? So there I was, happily studying Swedish when the doorbell rang last Monday evening, and I suddenly remembered: Oh crap! It's Halloween! I decided to answer the door before going to fetching the candy leftover from the pumpkin carving party (see below). Sure enough, there was a young girl in a black witch costume carrying a candle in a lantern in one hand, and small bag in the other. "Treat or treat," she said in polite, perfect English. I smiled and said "Ett ögonblick, jag kommer strax tillbaka" and hustled off to the kitchen to fetch the candy. When I came back, I held the bowl out to her, but her hands were full, so I grabbed a handful of stuff and dropped it into her bag. She stared at me, with big eyes. I stared back, still smiling but now suddenly starting to worry. Uh oh, now what have I done? I wondered. She waved around her hand that was holding the bag. I looked at it, in non-comprehension. She used the hand holding the lantern to point at the bag, somewhat frantically. She was holding two bags, as it turned out. The other bag had a ribbon around the top, and a cupcake inside it. She twisted her hand around so that the cupcake bag was towards me. "Trick or treat," she said again. After we stared at each other for what felt like eternity but was really only 15 or 20 seconds or so, I finally got it. "Åja! Är det för mig? Tack, tack så mycket!" I said and took the bag. Yes, that's right, she was bringing me a treat. On Sunday night had had had some friends over to carve pumpkins. It was fun and we had all the things necessary: pizza, beer, Doritos, too much candy, and old horror movies going on in the background on endless loop, with the sound off. Joe and I have seen these movies so often throughout childhood that we don't really pay attention; however, 'Frankenstein' proved to be too much of a lure to our guests so we ended up turning on the sound and half watching it. 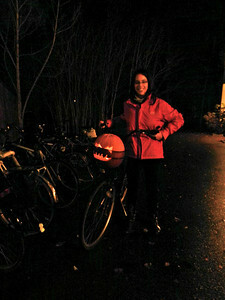 Our guests had all come on bicycles, of course; they managed to carry their jack-o-lanterns home with no reported incidents, and they looked quite festive doing it. ... which brings us back to our witch. She has rung our doorbell before dressed as a witch and in search of treats, but always at Easter, which is the Swedish holiday for candy begging. 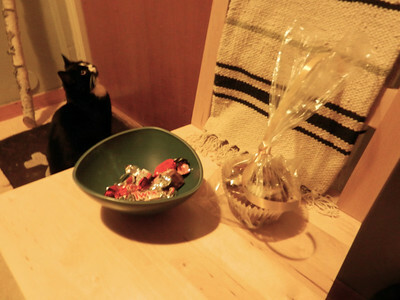 So it's a little extra amusing that the treat she brought was a Halloween version of an Easter sweet.